Home Uncategorized Basic Physiology and the Root Cause of Chronic Disease ? Warburg demonstrated that all forms of cancer are characterized by two basic conditions: acidosis and hypoxia (lack of oxygen). “Lack of oxygen and acidosis are two sides of the same coin: where you have one, you have the other.” All normal cells have an absolute requirement for oxygen, but cancer cells can live without oxygen -a rule without exception. “Deprive a cell 35% of its oxygen for 48 hours and it may become cancerous.”Dr. Warburg has made it clear that the root cause of cancer is oxygen deficiency, which creates an acidic state in the human body. Dr. Warburg also discovered that cancer cells are anaerobic (do not breathe oxygen) and cannot survive in the presence of high levels of oxygen, as found in an alkaline state. The root cause of disease is stress. Stress is defined as a straining force, an imbalance of forces. Stress is a form of opposition that stimulates adaptation, growth and development in any life form exposed to it. Stress is only “bad” when it is excessive, unbalanced and unchecked. The stress of pressure turns graphite into diamonds. The stress of sunlight is captured by chlorophyll in plants and converted into an energy form (glucose) that feeds the growth of the plant. The stress of the birthing process gives rise to new life. It was stress that formed the Grand Canyon, Niagara Falls and the Hawaiian Islands. Stress on muscles force them to grow in response to the opposition they encounter. Stress is a necessary stimulus for life. It is a catalyst for beauty and growth. However, when stress exceeds our limits to contain and manage it, disharmony and imbalance result. 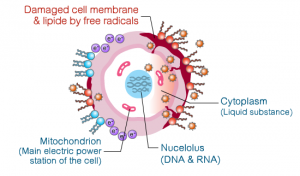 A free radical is an oxygen containing molecule that has one or more unpaired electrons, making it highly reactive with other molecules. component molecules which then seek and steal an electron from another molecule, therefore triggering a large chain of free radical reactions. Oxidative stress is the root cause of chronic disease. It is also believed to be responsible for the aging process. In simple terms oxidative stress is the chemical process of stealing electrons. It is a natural and predictable part of day-to-day cellular activity. When the oxygen molecule loses an electron, it becomes a free radical and begins to search for any molecule that might have an extra electron. Oxidation occurs when an electron is taken from a molecule by oxygen. Oxidation is how our bodies age, resulting in wrinkles. degeneration of organs, bones, muscles, tendons and cellular membranes. How Bad is Oxidative Stress? Acidic Stress is a precursor to oxidative stress. By definition, acidic stress is the result of chronic acid exposure, primarily from diets high in sugars, animal protein (especially red meat and dairy products), emotional stress, physical stress (via lactic acid buildup) or elimination problems such as kidney failure. The body goes to extreme measures to maintain a slightly alkaline pH in most tissues. For example, blood, the lifeline of the body, has an optimal pH of 7.35 – 7.45. Three primary buffering systems exist to help maintain this narrow pH window, underscoring the critical nature of pH in optimal physiology. The most powerful and rapid buffering system is the lungs. The faster we breathe the more acidic carbon dioxide we exhale, taking us back towards neutrality. Heavy breathing with exercise is a prime example of this quick and efficient mechanism of buffering the blood. The kidneys are the second major buffering system. Urine with a mean pH of 6.0 is nearly 15 times as acidic as blood because its role is to eliminate much of the acidic buildup that occurs within the body as a result of metabolism and exercise. When blood becomes overly acidic, the kidneys can reabsorb alkaline bicarbonate and excrete acidic hydrogen ions. This is a slower process that can take hours to days to fully buffer the blood but this system can do so with extreme precision, especially when the lungs are damaged because of health issues like chronic obstructive pulmonary disease (COPD). We are more then 75% water, one big biochemical reaction. The aging process seems to be associated with a relative loss of hydration. The elderly are believed to be only 65% water, while infants are very hydrated (75-80%). Due to the polar nature of water, it is the ideal solvent. We can weeks without food but only days without water. We are much more likely to be dehydrated than hungry. Water, That we are Drinking is killing us slowly and inevitably?